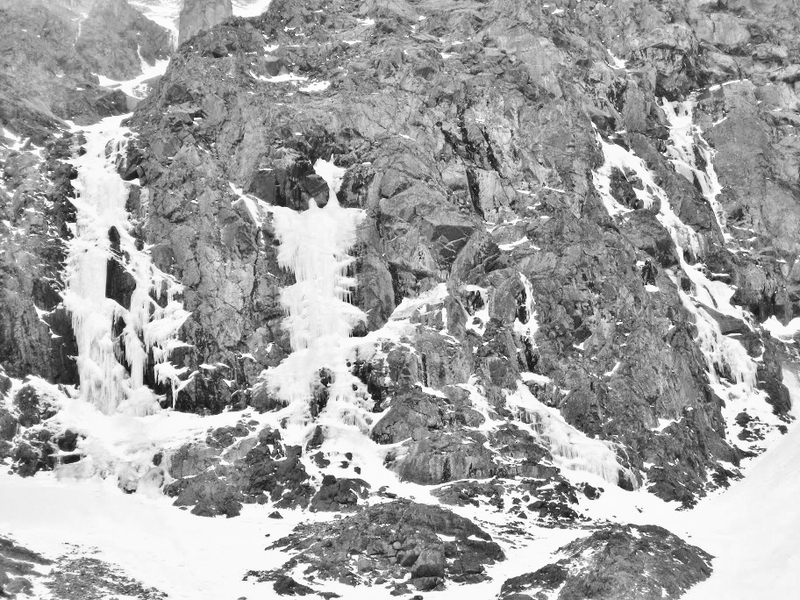 Gran Carambano (III, WI 5, 100m) in the Froze-To-Death Cirque of the Beartooth Mountains. The route follows the large, steep flow on the far left. As I was writing this post, I re-watched the raw, uncut helmet cam footage from the ascent, and it brought back a flood of memories from that day (including some colorful and hilarious dialogue)…so I’m guessing this story will end up being four or five installments instead of the originally predicted three. I paced outside the car as Olin closed the back door and eased his pack onto his shoulders. We were alone in the trail head parking lot – the noise of our boots crunching on the frozen, windswept gravel was the only sound to break the constant, monotonous moan of the wind. I shivered in the darkness, feeling the chill of the night air as it slithered its way beneath my layered clothing. A faint click came from Olin’s headlamp as he turned it on and sent the narrow beam of light onto the trail at the end of the lot. “You ready?” he questioned without looking back. “Yeah, let’s do it,” I said, shrugging my pack into a more comfortable position. I slipped my gloved hands into the loops on my trekking poles and switched on my own light. I ran through a last mental checklist to make sure I hadn’t forgotten anything we would need, and then, body and mind in rebellion, I trudged into the forest, following the dwindling pool of light that marked my partner’s position. My muscles screamed for a rest and my lungs and throat ached from inhaling the frigid air. Great clouds of condensation from our heavy breathing rose above our heads, forming ice crystals that glittered in the morning sun. It was beautiful and would have been worth taking off a glove to snap a picture, but it seemed like an unnecessary additional effort at the moment. We were well above the timberline now, and my legs were trembling from the exertion of breaking trail in the bottomless powder. Even with snowshoes, we were sinking in past our knees, and the packs loaded with ice tools, crampons, ice screws, and ropes seemed to grow heavier by the minute. I nodded. I had been here before, but had never gone off the beaten path and into the cirque. Olin had hiked up just a few weeks prior with local ice climbing legend Ron to attempt the climb. Ice conditions were bad, and Ron had backed off the first pitch. The thought of doing this approach twice in less than a month was awful; Olin was either very tough or he had a short memory. Or both. With the reward of traversing rather than climbing endless switchbacks through deep snow in front of me, I banged the ends of my poles together to clear the accumulated clumps of snow and turned back to the untrodden trail in front of us. I could handle a couple more switchbacks. I plodded mechanically up the final hill into the cirque, grateful to be following in Olin’s tracks. He had stopped about fifty feet in front of me at the crest of the hill and appeared to be studying the landscape, perhaps picking the path of least resistance for our tiring legs. He turned and smiled as I drew closer. I couldn’t see what he was talking about, so I just nodded wearily as I walked the last few steps to his position. Sliding my pack off my aching shoulders, I let it fall in the snow beside his and finally looked up to take in the view. My jaw dropped as I realized I was looking at our intended climb, just a few football fields away across a snowy boulder field. Massive rock walls rose in front of us and on both sides, spotted with snow patches and thin tendrils of ice. Our objective rose dramatically from the boulders, starting with a snow ramp that led to the crux: a long, narrow pillar that ascended a vertical rock face and eased into another series of snow and ice ramps above. Without a sense of scale, I couldn’t tell how big it was, but it was untouched and looked steep. 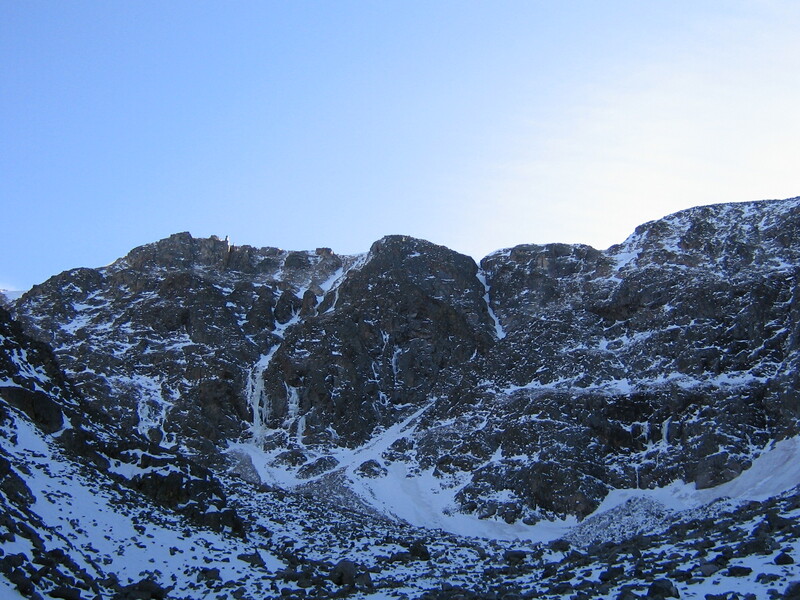 The first view of Gran Carambano at the far end of the cirque. Olin had taken this shot a few weeks earlier when snow conditions were much more conducive to a pleasant approach. I had never done a first ascent worth mentioning – only mossy, damp boulders and short piles of loose rock that would never entice a normal, well-adjusted climber into attempting a repeat. Now, however, I had the chance to satisfy my egotistical hunger on something beautiful, something people would admire and want to climb. Something my peers would talk about. Suddenly I wanted like I had never wanted before. I didn’t know how hard or dangerous the climbing might be, and I didn’t care. We were going to climb that route.